Sonic and Mario rivals from the mascot days of console gaming. We explore through the core series, racing/driving, sports and more. Their transition into the third dimension. 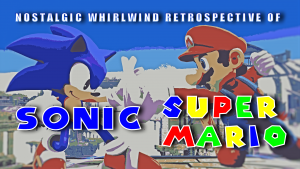 How Sonic and Mario have come together as well as looking at the future the potential crossover. How the video concept came about was gaming session and conversation about how the similarity of their character evolution was. The rivalry between SEGA and Nintendo, one being on top of the world the other the biting competitor. Sonic and Mario being the main guns of the arsenal of the companies. Pairing up title vs title, side by side. Sonic Transformed up against Mario Kart 8. However how can one not include Sonic R? Was Sonic Drift the mirror of Super Mario Kart. Yet how different the evolution to 3D was for each characters. So the idea came about doing comparison. However the catagories and groupings are wider. than first cast. So grouped the circles into Core Series, charting Super Mario 1, 2,3 and New. Sonic 1, 2, 3, Knuckles and CD. Racing / Driving Mario Kart, Sonic R, Sonic Drift, Sonic All Stars and Transformed. Sports Tennis, Golf, Basketball and other sports. The move to 3D, Mario 64, Sunshine, Galaxy 1/2. Sonic Labyrinth, Sonic 3Ds, Sonic Adventure, Lost World. With commentary through the nostalgia and gameplay fun. Available to watch now.